Jerry Roman, founder of Cleveland's Roman Chariot, is now available to help you have the car of your dreams. He can work with you and recommend the best and most reliable shops in Northern Ohio for your automotive project. Best of all, he can help you for with not cost to you. Thats right. You can make use of his years of experience and expertise at no extra cost to you. Roman will use his established discounts and take a small service fee from that. In most cases, he can save you money. 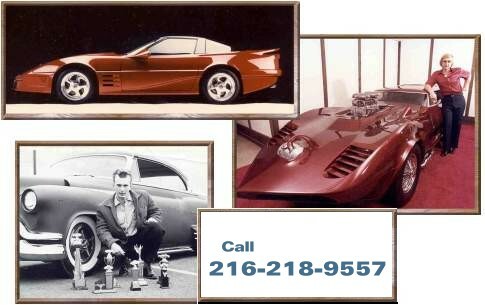 From smaller projects to complete automotive make overs, give Jerry a call. Thanks for stopping by and seeing us at the Cleveland Auto-Rama. 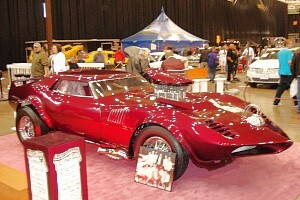 Jerry Roman, founder of Roman Chariot, has been leading the way in automotive restyling since 1961. Since the close of Roman Chariot, Jerry has continued to enhance your car, truck or motorcycle with a diverse number of accessories and painting techniques. If you need any of these services and remember the top quality work done at Roman Chariot, give Jerry a call. He's still in Cleveland. Sunroofs, T-Tops, Simulated Convertibles, Custom Grills, Accessories, Pin Stripping, Decals, Vinyl Tops, Custom Wheels, Fender Skirts and Ground Effects can be used in the restyling of any vehicle. Roman is now a consultant for the Auto Restyling and Performance Industry and has the experience and services to make businesses more viable..
Click for General Information and History. Click to Contact Jerry Roman. Click for Information on our policies, payment methods and terms. Click for Information about how we ship and approximate transit times. Nothing changes the front of your car like a new grille. Ours are made from the highest quality materials - stainless steel and chrome. They come with a 2 year warranty.